(From the right) David Khan Johnson talks with Sean Lennon and his band at the Glastonbury Festival. (From the Left) Robbie Shakespeare, Khan, and Sly Dunbar in the studio, NYC. (r to l) Trent Reznor, Rob Sheridan, and Khan kill aliens on the Men in Black ride. Jhonn Balance and Peter Christopherson from Coil's enscription to Khan in the book Hengeworld. With Brian Molko from Placebo at a radio show in Detroit. Jimmy Buffett performs with Pacific Orchestra in Key West. (From the left) "Conga" George Terzis, Jimmy Buffett, Khan, and Rick Fraley (Photo by Tom Corcoran). A stranger calls attention to a crop circle outside of Avebury in the UK. Note Silbury Hill in the background, the largest manmade mound in Europe. Rob Halford dressed in his Mardi Gras costume preparing to ride on Trent Reznor's float. Letter from Brad Nowell of Sublime. 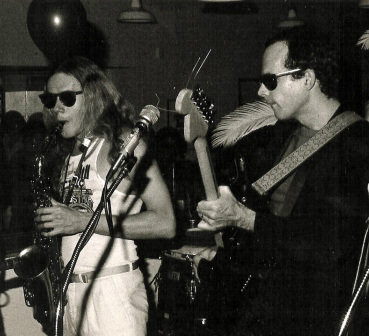 (l to r) John Gladstone and David Khan Johnson perform with Pacific Orchestra in Key West. With Claude Sarne from the band 12 Rounds. The faded ticket for the premier of Brian Wilson's Smile presented by Glenn Max at the Royal Festival Hall in London. (l to r) James Taylor, Khan, and Stephen Stills perform with Pacific Orchestra at Trax in NYC. Khan, playing Trent Reznor's new grand piano, entertains at his Mardi Gras party. Clint Mansell, with red hair, takes the music seriously. The author at work (photo by Peter Johnson).